A BBQ is serious business. We have pulled together some sensational recipes and some top tips that will make you King of the Grill! BBQ’s should be reserved for those days of blazing sunshine when all you want to do in the late afternoon and early evening is enjoy a drink and a meal with your nearest and dearest. If the temperature is soaring, think about timing. You don’t want to start the party too early – to do so would just result in a very comfortable experience for all! Make sure that it is cool enough to allow comfortable eating. A BBQ needs food of course and it needs drink! Ice-cold beer goes down a treat. Get plenty of bottles and cans from the local supermarket and most importantly, keep the ice on tap. Beer needs to be cold so you can either clear your fridge or fill up the bathtub! Have alternatives for the non-beer drinkers. Soft drinks and mineral water, both still and sparkling, are a must! Cocktails should also be available. Rather than making fussy individual martinis, prepare a special drink in bulk. Pitchers of mojitos, packed full of crushed ice and mint will be a refreshing drink that will also get the party started! As well as thinking about the food and drinks that you are going to serve, think about the atmosphere that you want to create. Add a few simple touches to make everyone welcome. Place candles out as the party moves from day to night. Get scented ones that distract mosquitoes and other bugs from gate-crashing your shindig! Alternatively, string some fairy lights around your garden and pair with a good soundtrack that fits the mood of the party. Food is one of the most important parts of a BBQ. The good news is that it is all relatively healthy. BBQ’s drain the fat away from the meat, whilst still retaining the flavour. Sausages and burgers are the standard BBQ meats but are you tired of eating the same old dishes? Here are some low fat and delicious alternatives, which can be served alongside those classics. Simple mix the ingredients in a small bowl and then rub them well into the salmon fillets. Let them drink in the marinade for about two hours before they hit the grill. Salmon only takes about 5 minutes to cook through so keep an eye on it when it is being BBQ’d. BBQ’s are not meat-only affairs. In most you cases you can substitute the meat or fish for a veggie friendly alternative. Here is an example. This is a dish that can be adapted for chicken or tofu, a protein packed super food. Mix the paprika, tomato sauce, soy, olive oil and in a bowl, adding in the chicken or tofu. Let the meat/meat substitute absorb the marinade for about an hour or two in a cool place. Remove the meat/meat substitute and thread them, along with the peppers, along a kebab skewer. Then simply BBQ for about 15 minutes. If you have any leftover marinade, pour it on the kebabs as they cook to guarantee a flavour packed dish. And who could exclude this classic veggie side dish? Although its not the most elegant item to eat, get stuck into this low calorie snack. Corn on the cob is an economical addition to the BBQ and the smoked flavour contrasts nicely with the sweetness of the corn. It only takes about 15 minutes to cook. Butter is optional. Before we leave you to get planning your BBQ, a word of warning. It’s all too easy to inadvertently make your friends and family ill! Make sure that all meat is completely defrosted – this will ensure that the meat is cooked evenly. Once you have defrosted the meat, keep it cool. Never leave it lying out in the hot sun for too long. 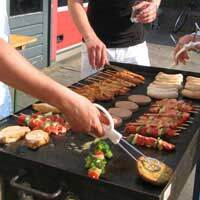 A BBQ is generally a thorough way of cooking and the margin for error can be low but sometimes meats are not property cooked and harmful bacteria can make its way into your guests’ mouths. Avoid this trap – get hold of a food thermometer and discretely make sure that everything served is safe to eat. Follow these golden rules and you will get the summer kicked off on the right foot!